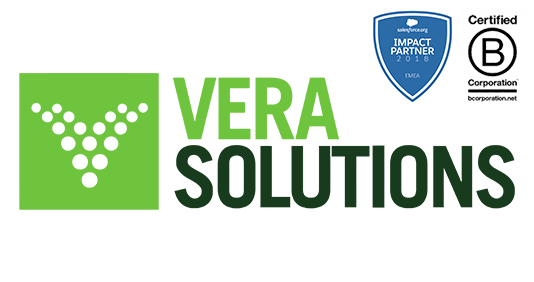 Vera Solutions is a social enterprise and Certified B Corporation® building cloud and mobile applications for social impact organizations worldwide. Our clients—more than 250 organizations in over 45 countries—include major iNGOs and grant-making organizations, social enterprises, and community-based organizations. Our solutions help organizations working in health, education, and development to collect, analyze and utilize real-time, high-quality programmatic data, automate processes, and work more efficiently and effectively. Vera’s work is centered on the Force.com platform, the world’s leading cloud application development platform. Vera is a growing organization, with more than 50 full-time staff based in Amsterdam, Boston, Cape Town, Dar es Salaam, Geneva, London, Mumbai, Nairobi, New York, and Washington DC. Vera is a Salesforce.org International Impact Partner and an ANDE member. We have been honored with Global Good Fund, Echoing Green, Rainer Arnhold, Dasra Social Impact, Bluhm/Helfand Social Innovation Fellowships, the Genesis Prize, and have been featured in Forbes Magazine’s 30 Under 30 Social Entrepreneurs and Entrepreneur Magazine’s 30 Startups to Watch. The Senior Consultant will work on Vera project consulting teams to design and configure operations/program monitoring, management, and evaluation systems for social impact organizations. Senior Consultants manage client relationships and project delivery according to quality standards. They are involved throughout the entirety of a project’s lifecycle — gathering requirements, building cloud-based data systems, providing training to system users, and supporting system implementation and rollout. Additionally, Senior Consultants support directors in lead generation and the sales process, and eventually lead sales. Senior Consultants are leaders in the hub and will be expected to take on leadership responsibilities, including supporting internal learning and team management. As a Senior Consultant, you’ll gain valuable experience with and knowledge of Salesforce (the world’s leading cloud-computing platform, currently used by more than 150,000 for-profit and 30,000 non-profit organizations worldwide). You will gain first-hand experience implementing program monitoring, management, and evaluation systems in health, education, human rights, and other development sectors, while working in a global marketplace. You will join our team of passionate humans with diverse backgrounds and experiences, all dedicated to improving the way social impact organizations operate. We’re a self-motivated, creative group, and we emphasize collaboration, flexibility, and professionalism. Vera is a young, rapidly growing company; we encourage all team members to push their own boundaries and drive the company in new directions. Curiosity and problem-solving skills — do problems slow you down or drive you to seek solutions? Vera Solutions offers competitive compensation (including benefits), commensurate with experience and cost of living. Applications are rolling, but you should submit your application ASAP. For additional information, please contact jobs@verasolutions.org.